A man has been airlifted to hospital after being badly injured on a farm in Aberdeenshire. The incident happened in the Maud area on Friday morning. 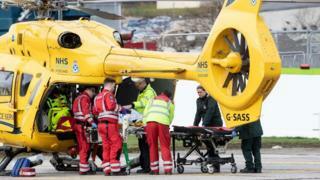 The Scottish Ambulance Service said the man was flown to Aberdeen Royal Infirmary. The Scottish Fire and Rescue Service assisted at the scene. A spokeswoman for the Health and Safety Executive said: "We are aware of an incident at a farm in Maud earlier today. "We are currently liaising with Police Scotland."